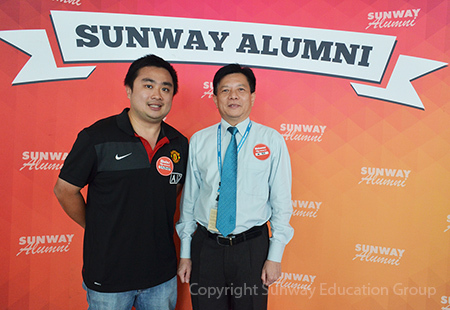 Teo Ee Sing, Executive Director of Sunway College warmly greeted and welcomed the alumni. “Welcome back! We are glad to see you back here as we hope to stay in touch with you and explore the possibilities for you to contribute back to Sunway. You are all welcome to come back to teach and share your industry knowledge and success with our students,” said Teo. Stephen Lee How Hwang, Assistant Manager of Sunway Group’s Internal Audit was one of the best examples of those contributing back to their alma mater. Stephen left Sunway TES in 2007 with CAT and ACCA qualifications but returned to Sunway from time to time for the Sunway Mentoring Programme. This programme provides opportunities for current Sunway students to learn from their mentors, who are also Sunway alumni. The Student Services Department Alumni Office works to match profiles and pair a student to a member of the alumni who will be the student’s mentor. The mentor will then assist and provide academic guidance, industry insights, career advice and personal development. Besides the mentoring programme, Lee also introduced the International Enterprise Challenge to Sunway TES, which is jointly organised by Sunway TES, Premier League, Premier Skills and the British Council. Utilising the global appeal of the English football Premier League, the International Enterprise Challenge aims to engage, inspire and unlock potential amongst 14 to 19 year old Sunway TES CAE accounting students by developing their business and enterprising skills through examples drawn from the commercial football sector. In the second running of the competition, the team from Sunway TES emerged as national champion and is qualified for the international level. All this would not be possible without Lee’s efforts. In addition to college friends, the event also enabled the alumni to catch up with their lecturers. More than half of the alumni who attended the event were once Kiran Seth’s students. Being a lecturer with Sunway TES for over 12 years, Kiran is proud to have touched the lives of over thousands of accounting students. She recently became a Sunway TES alumna upon completing the Certified Internal Auditor (CIA) programme. “I enjoy imparting knowledge and experience to students. Taking the CIA programme definitely kept me on my toes as it fills my teaching gaps and enables my teaching to be up-to-date,” said the mother of two, who feels that ‘mingling with the young keeps her young’. 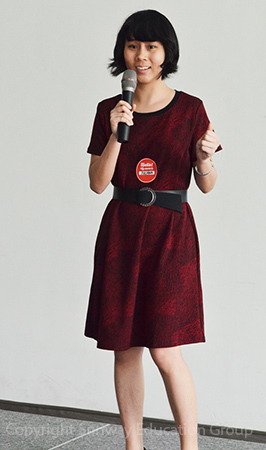 The event was brought up a notch with a surprise stand-up comedy performance by alumna Juliana Heng Hui Jing. “My day job is an Executive at the Management Services of a Malaysian property investment company, but at night I am a stand-up comedian,” said Juliana who left Sunway TES in 2011 with CAT and ACCA qualifications. Her performance drew much laughter in the hall with some of her jokes such as living in Sea Park without the sea and in a long distance relationship with future boyfriend. The Alumni Catch Up is definitely got off with a good start for the SAGC. Melissa Tan Hui Ying, President of SAGC is hopeful to connect with more Sunway TES alumni via various big and small scale activities. For more information about Sunway TES Accountancy Graduates Club (SAGC), please email stes_alumni@sunway.edu.my. 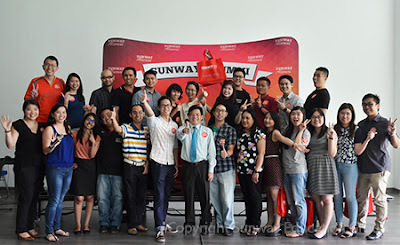 For Sunway TES programmes, please visit http://sunway.edu.my/college/sunwaytes or call 03-74918622.